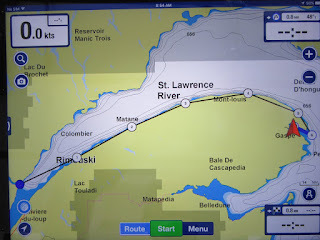 We departed Riviere-La-Madeline at 0800 under a sun cloud mix and a light 8 knot south west wind from behind his, providing a very pleasant ride for this 45 mile run. 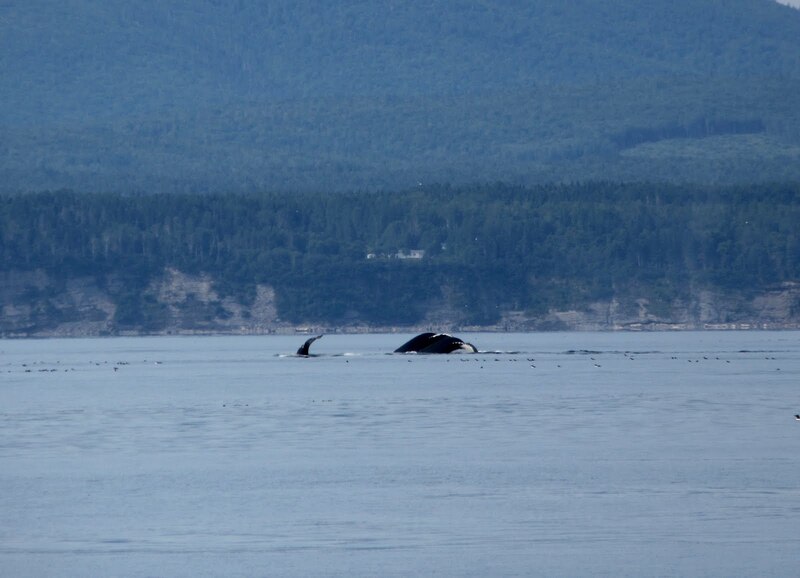 Locals had advised us there were far more whales along the Gaspe this year so we were pumped, keeping a close watch for any sightings. The other thing we are watching for are the Transat sailing race boats, who got started in Quebec City yesterday (Sunday). 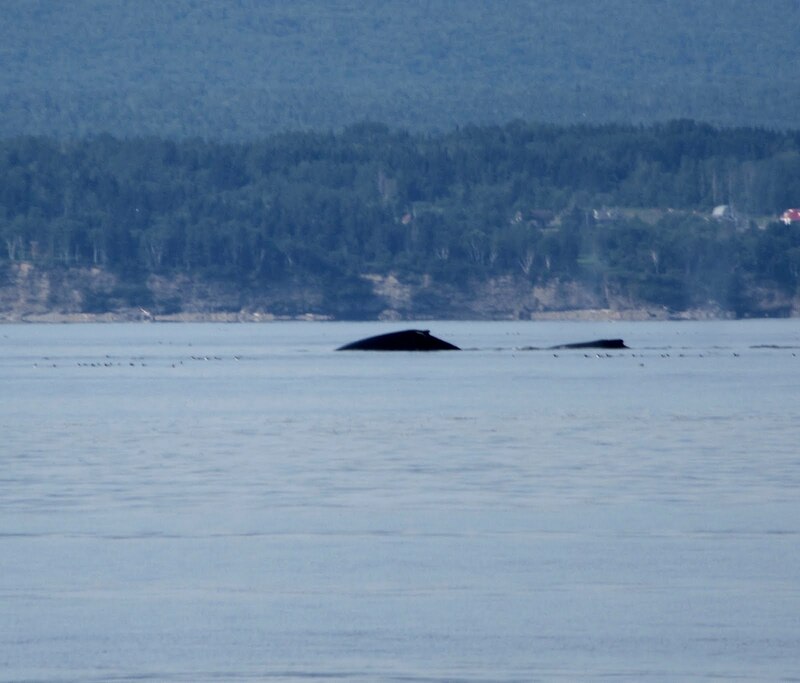 We were told they were making their way along the south shore of the St. Lawrence and would probably pass us today. 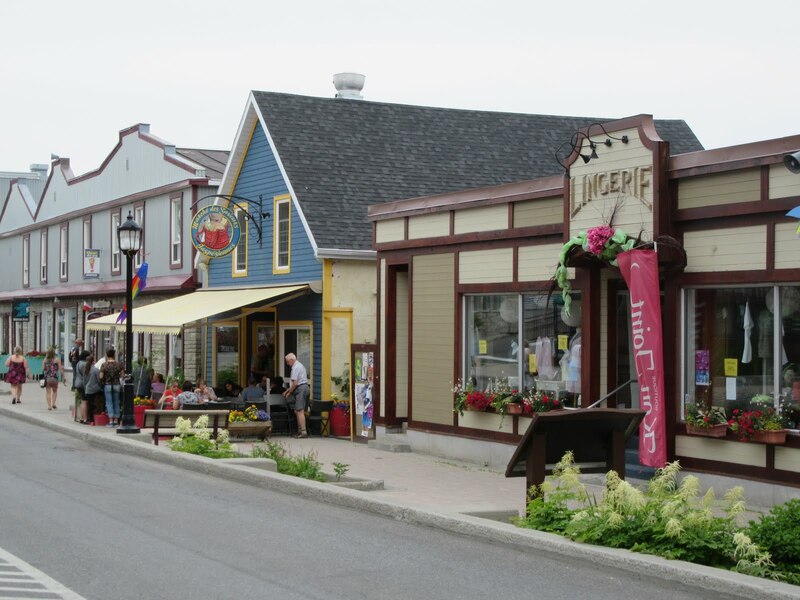 Our destination for today is Riviere-Au-Renard, a village originally settled in 1790 by French Canadian and Irish families. How did those Irish families end up here you ask? The famine ship “Carrick of Whitehaven” sailed with 187 aboard in March 1844 from Sligo, Ireland, its passengers fleeing Ireland’s famine for Canada. The Carrick had a smooth crossing of the North Atlantic and she entered the St. Lawrence, nearing their destination without incident. Suddenly they were hit by a vicious storm from the north and due to ice in the rigging, the crew were unable to shorten sail before the ship was blown on the rocks close to a little settlement at Cap-de-Rosiers, near the tip of the Gaspe peninsula. 118 of the crew and passengers drowned with only 48 rescued by local fishermen. Eighty-seven bodies washed ashore were buried in a mass grave over which an imposing monument in the shape of a cross, was erected in their memory. 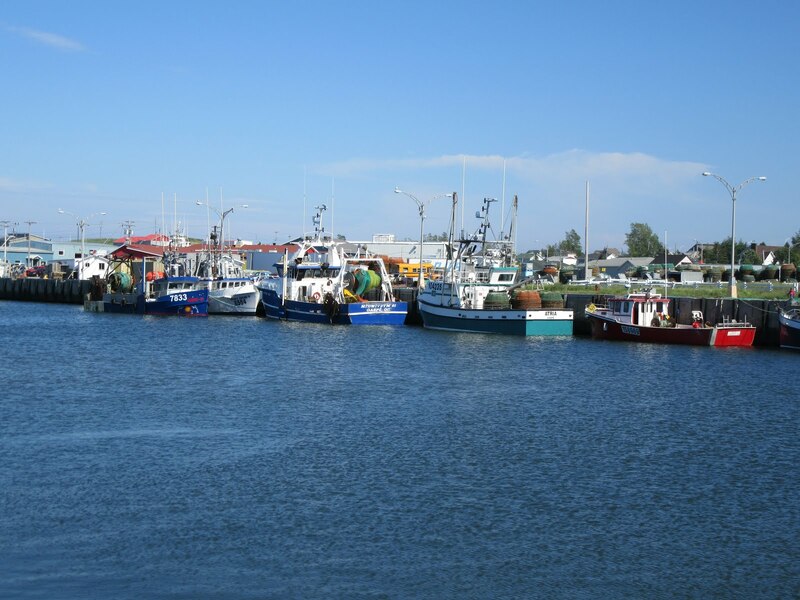 Many of the survivors from that tragedy settled in the Gulf of St. Lawrence, including Riviere-Au-Renard, and their descendants can still be traced by their distinctive Irish surnames. 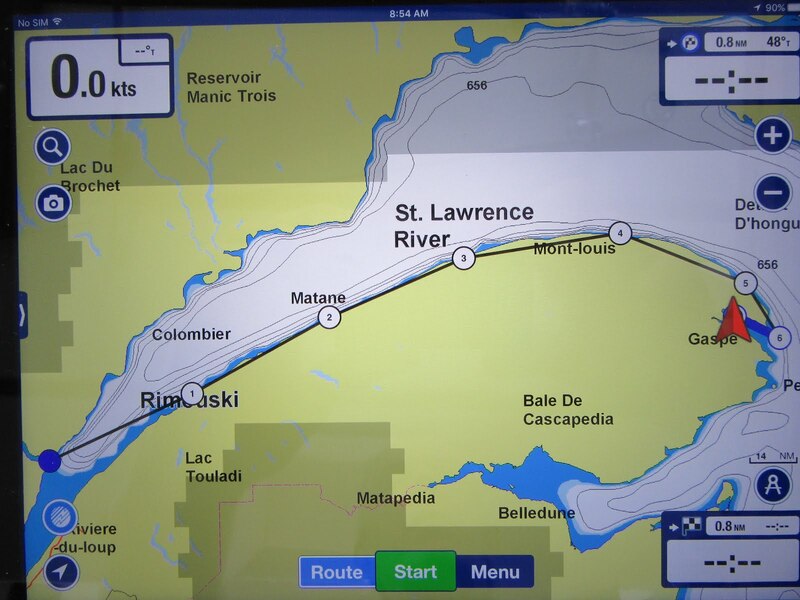 En route to Riviere-au-Renard, we began to experience ocean swells for the first time and much earlier than we’d expected. The swells likely originate way out in the Atlantic and roll through the Gulf of St. Lawrence and right on up the St. Lawrence River. 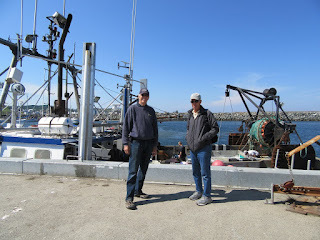 Surprisingly, with two foot “wind waves” from behind us and larger ocean swells from in front of us, it was a very comfortable ride. 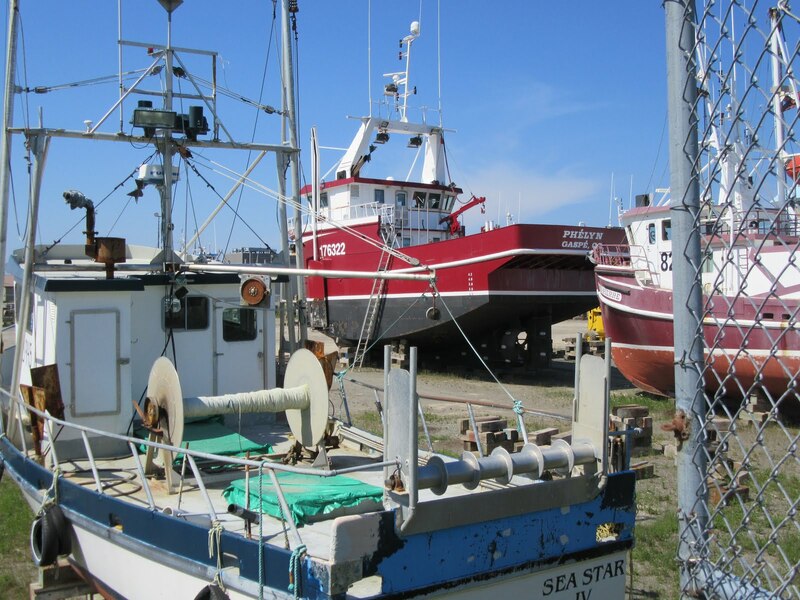 Riviere-au-Renard is the largest commercial fishing port in Atlantic Canada. There was a very large fleet of fishing trawlers, a fish processing plant and a large fleet of trucks coming and going. Through the afternoon, there was a 20 knot + wind roaring through the harbour. 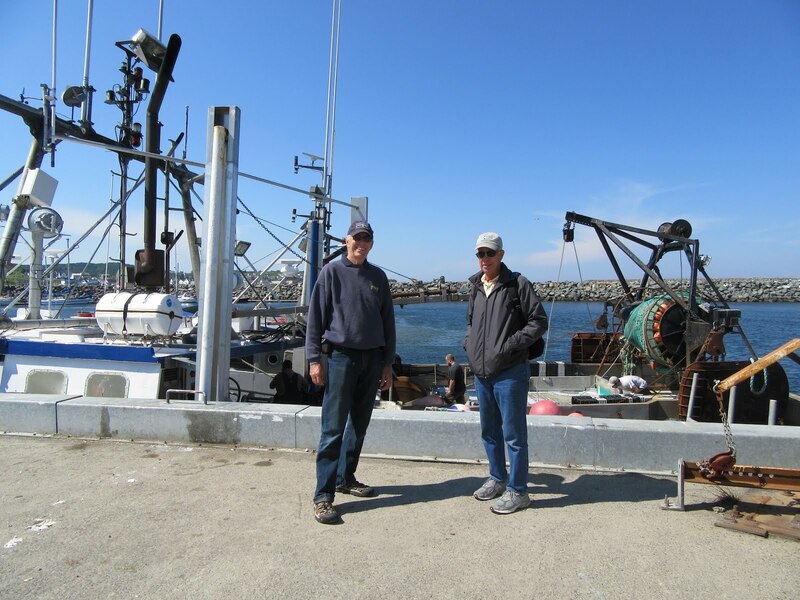 Locals were very helpful with our docking at the recreational boat docks which share a large basin with the commercial fishing fleet. It was very interesting to walk the commercial pier and see all the activities that are the life blood of this village. 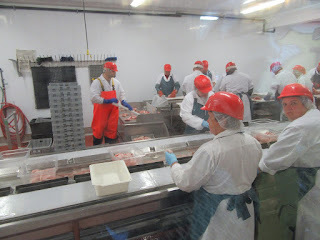 Afterwards, we walked some of the village, stopping at the fish processing plant to buy some fresh ocean perch and salmon. 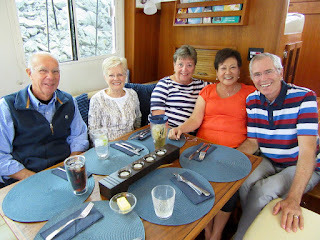 Later, we were excited to watch four of the Transat mono hull sailboat racing fleet roar past with their enormous spinnakers flying. In late afternoon, the wind died down and the sun was hot enough for me to put on shorts for the first time in about 10 days or so. After dinner, their was a local singer putting on a concert by the marina clubhouse with her lovely voice carrying over across the docks. Once again, weather is calling the shots for us, with a high wind forecast for later in the day. 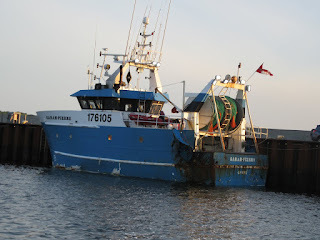 We are up at 0420, watch the sun rise at around 0430 and are off the dock by 0500 under perfect sunny skies. 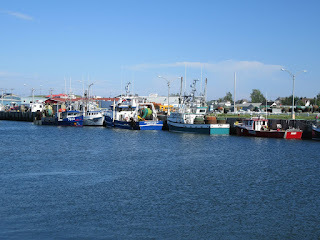 Our route today took us out and around the Forillion Peninsula (a National Park) and back up into the Baie de Gaspe to the town of Gaspe. 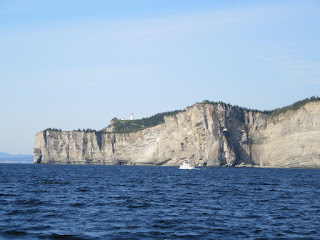 I don’t think we’ve ever seen such a dramatic set of cliffs from the water, and as we passed by them, the lighting conditions were constantly changing encouraging us to take more and more pictures. As we entered the Baie de Gaspe, the water turned dead calm setting us up for a feast of nature for our eyes. 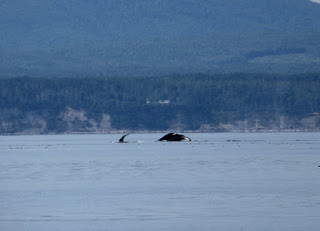 First we saw and followed groups of three and five humpback whales, minke whales and many porpoises. 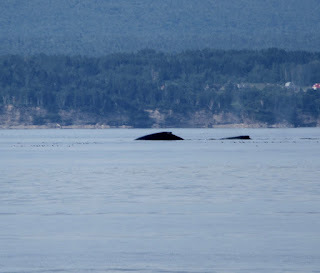 All were easy to spot with the calm water, but not so easy to photograph. 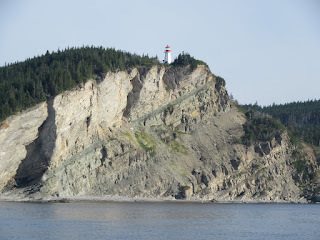 It took us a good hour to transit the length of Baie de Gaspe and we spent the bulk of that time with binoculars glued to our eyes following the activities of the whales and porpoises. What a thrill. 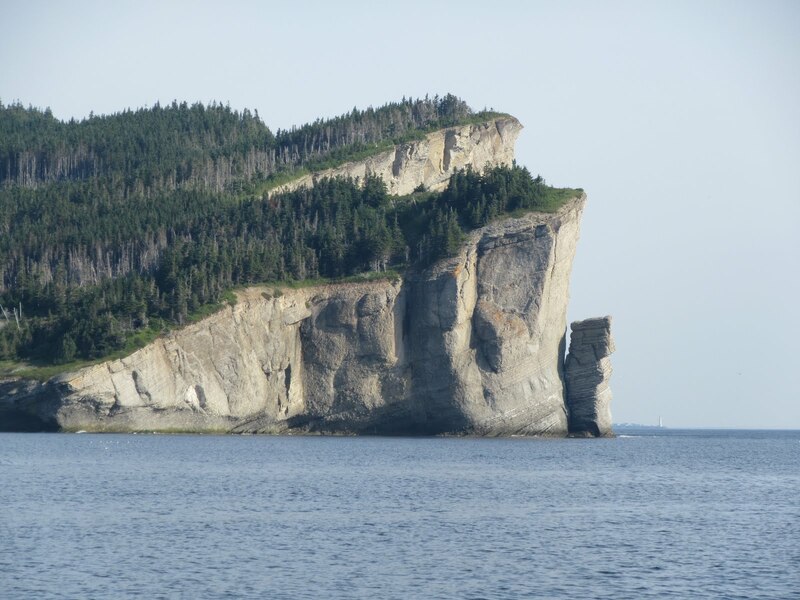 Jacques Cartier stopped at Gaspe on June 24, 1534 and took possession of the area, erecting a wooden cross with the King’s Coat of Arms on it. Following the Treaty of Paris in 1783, British officers and soldiers acquired free land in the area and they were later joined by many Loyalist settlers. 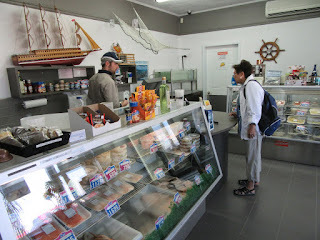 Gaspe quickly became an important commercial fishing centre for cod. In 1934, the Federal Government commissioned and installed a 32’ high, 42 ton granite cross cut from a single block of grey granite extracted from a quarry in the Portneuf region of Quebec to commemorate the 400th anniversary of Jacques Cartier arriving here. 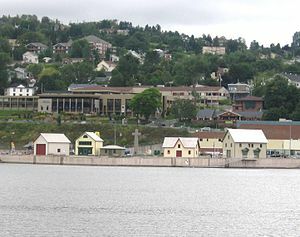 During World War II, 3,000 soldiers were stationed at the Gaspe naval base to patrol and protect the Gulf of St. Lawrence against German submarines. 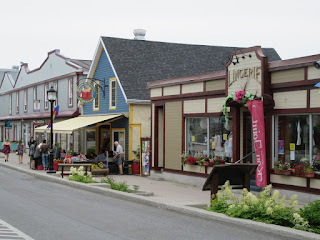 Gaspe is home to a factory that produces blades for the massive windmill turbines that we see all along the St. Lawrence River and elsewhere. 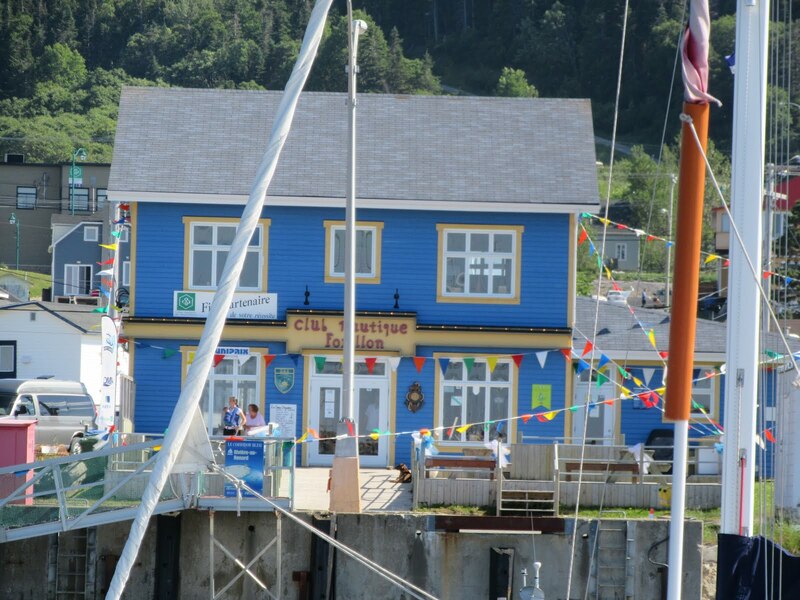 Tourism is also a major contributor to the local economy with thousands arriving each year to see the Forillion National Park, to fish, go whale watching and enjoy the Gaspe area. Today also happens to be my birthday. I received calls from our daughters and some grand children. Fran also prepared the most wonderful seafood crepes ever and the crews of Wings and Encore joined us for dinner to help celebrate the occasion. I also received many emails and Facebook birthday wishes. What a magnificent way to spend a birthday. I couldn’t have asked for more.